These have flaps with no pockets. For fabrics available click: HERE. Size Small Boys' Waiscoats fit up to a chest size 26 and are 22" long. These waistcoats fit most 4 to 6 years old. Please allow 6 weeks for shipment. Size Medium Boys' Waiscoats fit up to a chest size 30 and are 26" long. These waistcoats fit most 8 to 10 years old. Size Large Boys' Waiscoats fit up to a chest size 34 and are 28" long. These waiscoats fit most 12 to 14 years old. These have a french fly, ties at the knees,a drawstring on the waist band, and no pockets. 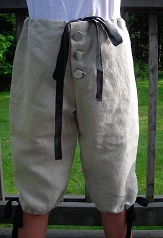 Size Small Boys' Breeches fit waist 20" to 26" and have a 13" inseam. These boys' breeches fit most 4 to 6 years old. Size Medium Boys' Breeches fit waist 24" to 30" and have a 15" inseam. These boys' breeches for most 8 to 10 years old. Size Large Boys' Breeches fit waist 28" to 34" have a 17" inseam. These boys' breeches fit most 10 to 12 years old.